Posted on September 5, 2010	by Lou Murray, Ph.D. 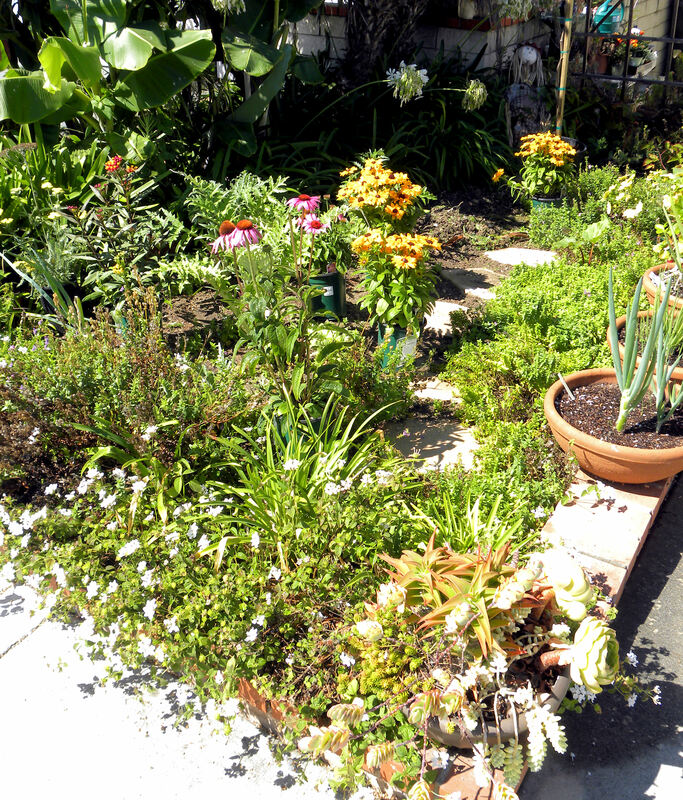 I don’t just “square foot” garden. I “square inch” garden. 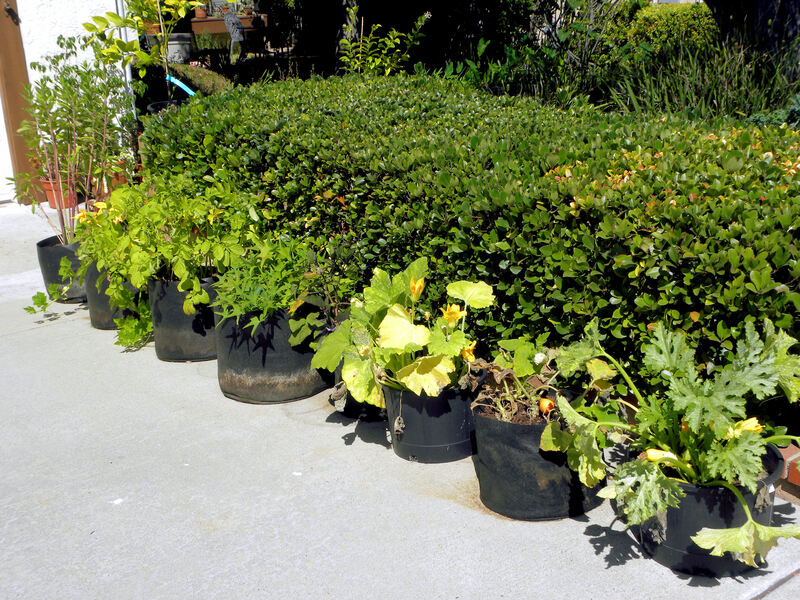 With a small southern California yard but a year-round growing season, I make every square inch count. I grow peas in this tiny strip during the cool season, and green beans in the summer. Today I dug up the dirt strip next to the water and electric meters and planted a row of Ferry Morse Melting Sugar snow peas. Here in southern California, we generally start our fall gardens in mid-September, but I decided to jump the gun a bit. 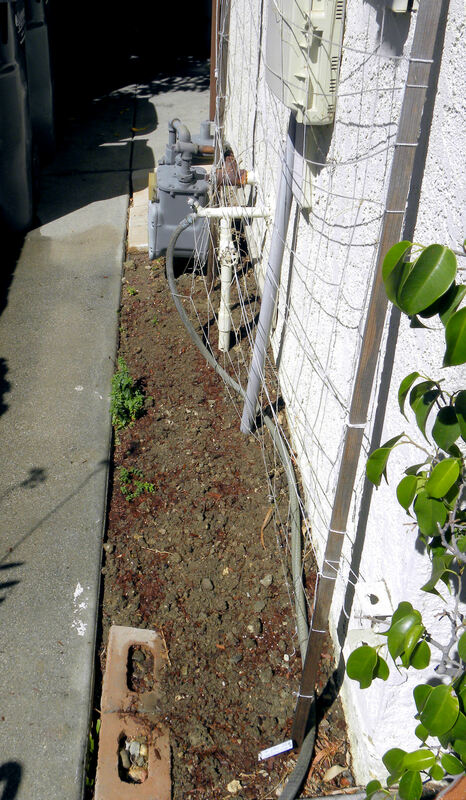 I am so sure that we’re going to get the Huntington Beach Community Garden up and running very soon that I decided to give up trying to grow vegetables in the Garden of Perpetual Responsibility by the driveway. I bought some perennial (and a few annual) flowers that appeal to butterflies and bees, and am going to plant a garden for pollinators instead. My Garden of Perpetual Responsibility at the beginning of the Labor Day weekend. My neighbor has planted guava and banana trees on her side that cast a deep shade over my garden in winter. Some idiot dumped gravel in the planter when the house was first built, instead of using organic compost to improve drainage. So I am constantly contending with rocks in that patch. And finally, my neighbor doesn’t weed her side, and I’ve let the weeds go to seed once too often on my side. The result is a lovely seed bank of weed seeds. I’m giving up on it. I still have artichokes, blackberries and a miserable, struggling rhubarb there, but the rest is going to be flowers. Nice big (healthy?) flowers that smother out the weeds. Well, that’s the plan. Yesterday, I pulled up several armfuls of weeds. Now I have pots of coneflowers, black-eyed Susans, a narrow-leafed milkweed, golden yarrow and lantana waiting to go into the ground there. I also have a new Fuyu persimmon tree that is going to go into that plot. It will grow taller than the neighbor’s guava tree and will capture sunlight better than my struggling tomatoes, lettuce, pumpkins and onions were able to do in previous years. 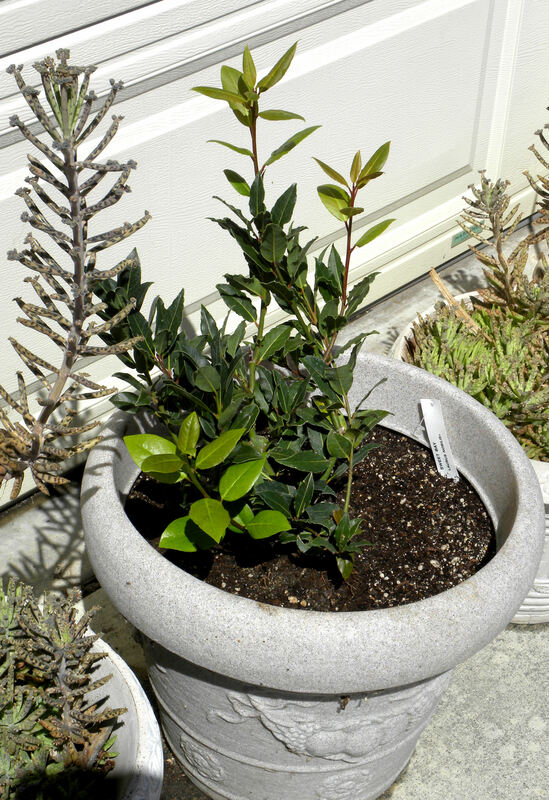 Small California bay laurel tree in a pot. Phew, that’s a heck of a lot of trees! The olive is a full-sized tree, but never makes olives because we keep it pruned back. Most of those trees are dwarf or semi-dwarf. Some are full-sized that I stupidly thought were semi-dwarf. If they get too big, I’ll have to cut them down. But in the meantime, we get produce all year long from one or another of them. 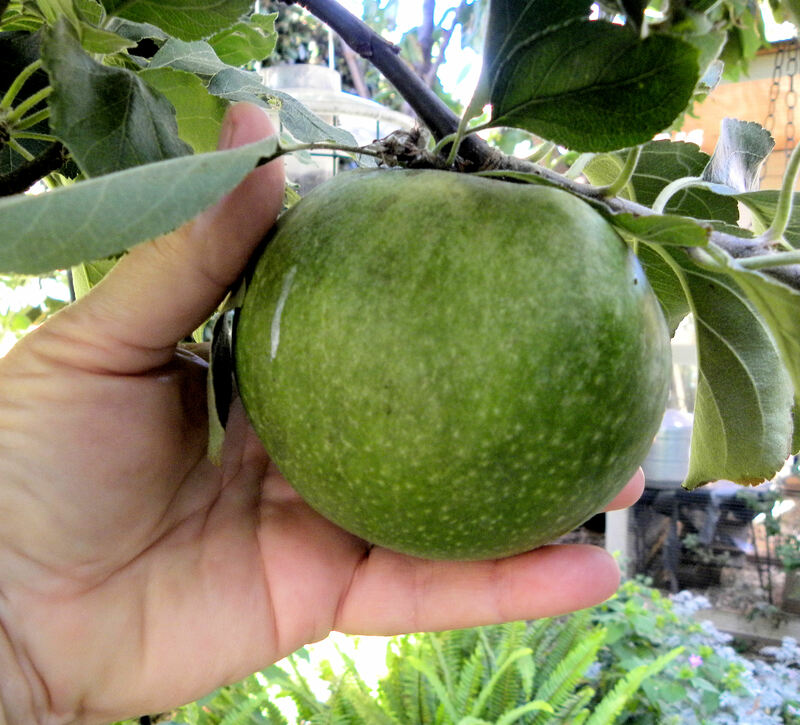 Granny Smith apples on the dwarf tree are full-sized apples. And then some! 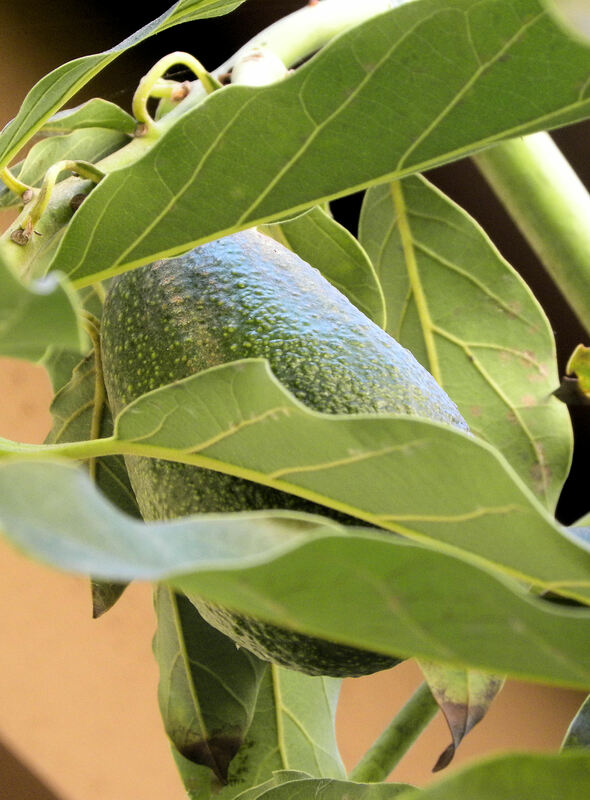 Our Littlecado avocado never sets fruit, so I planted a Haas avocado next to it. I didn't think it set any fruit again this year, but I recently discovered 3 avocados on the Littlecado. I can hardly wait for them to get ripe. 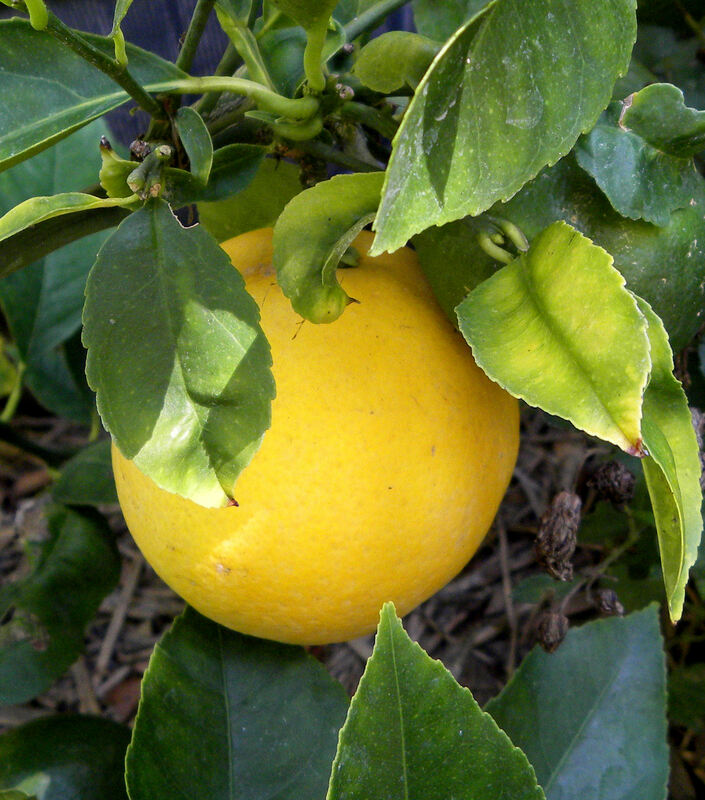 According to the book Restoring America’s Food Traditions, the Meyer lemon tree is declining in favor of Eureka lemons. I have three dwarf Eurekas in pots, but am also growing a nice Meyer lemon in the ground. I’ve located a spot where I can fit in yet another Meyer lemon, so that may become fruit tree #27 in our yard one of these days. 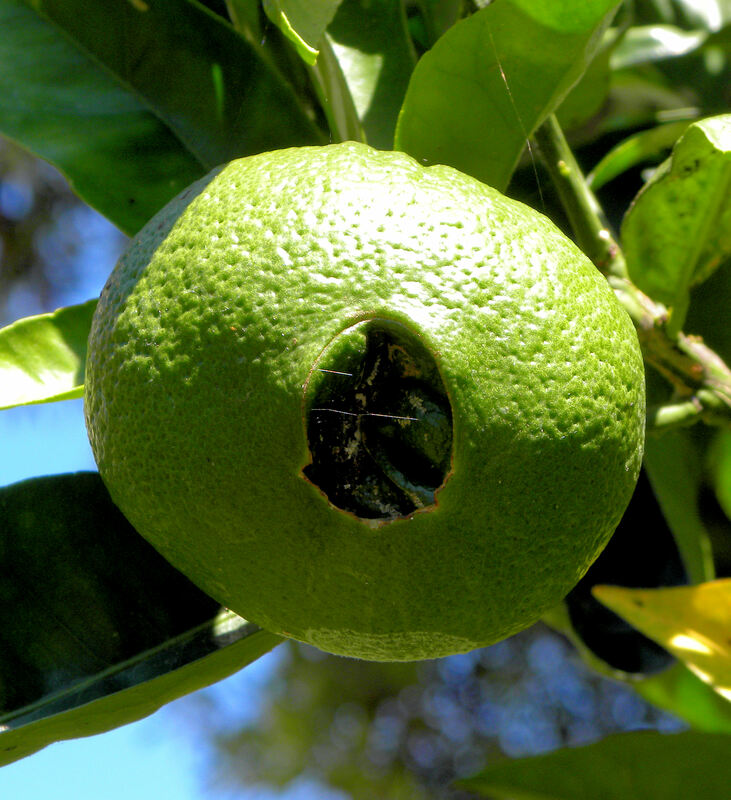 Here is a "belly button" shot of a navel orange that should be ripe in January. 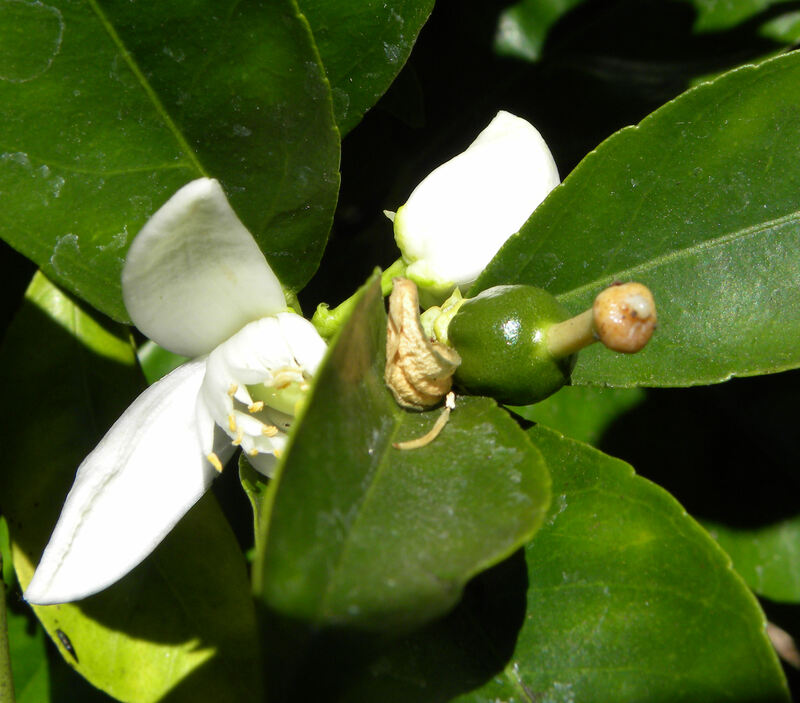 The navel orange tree set only a half dozen oranges during its normal bloom period in April. The crazy tree is blooming again now in August and September and setting more fruit. I'm guessing that the cold summer here tricked it into thinking that winter was over. Global weirding! 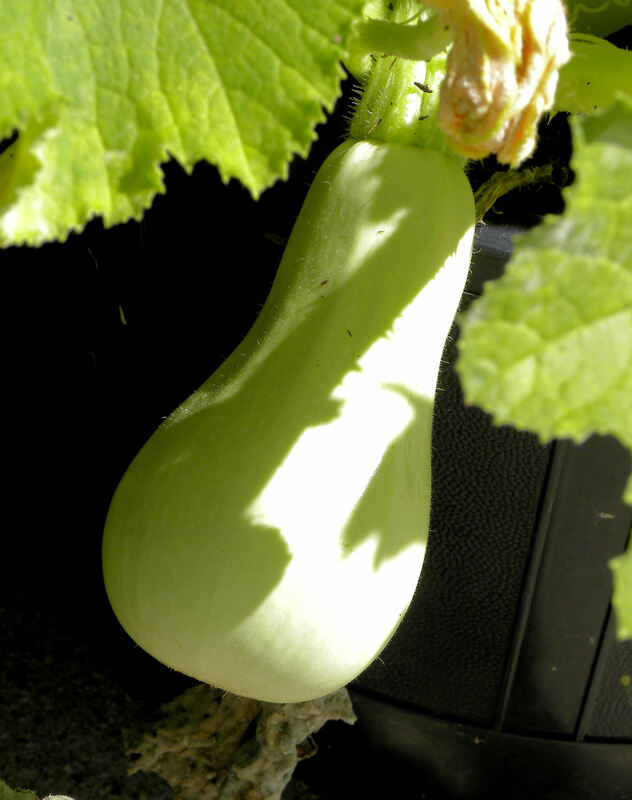 Life is about more than fruit trees, so here is an update on my pathetic year of trying to grow squash and pumpkins. The first female flower opened on one of my two Amish pie pumpkin plants, but there were no male flowers open yet. It didn't get fertilized. 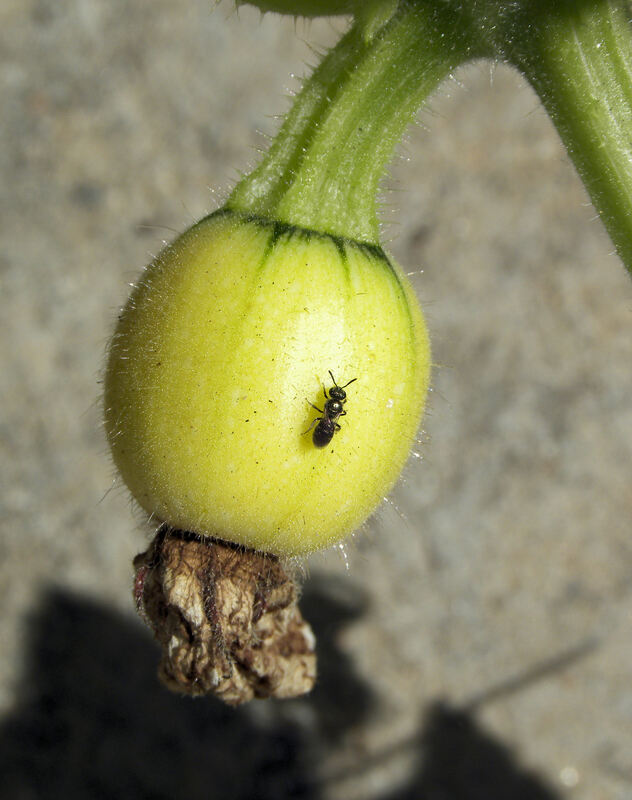 The first squash has set fruit on what is supposed to be a Clarinette Lebanese zucchini, but this looks suspiciously like a butternut. Wouldn't be the first time I've gotten mislabeled seeds. 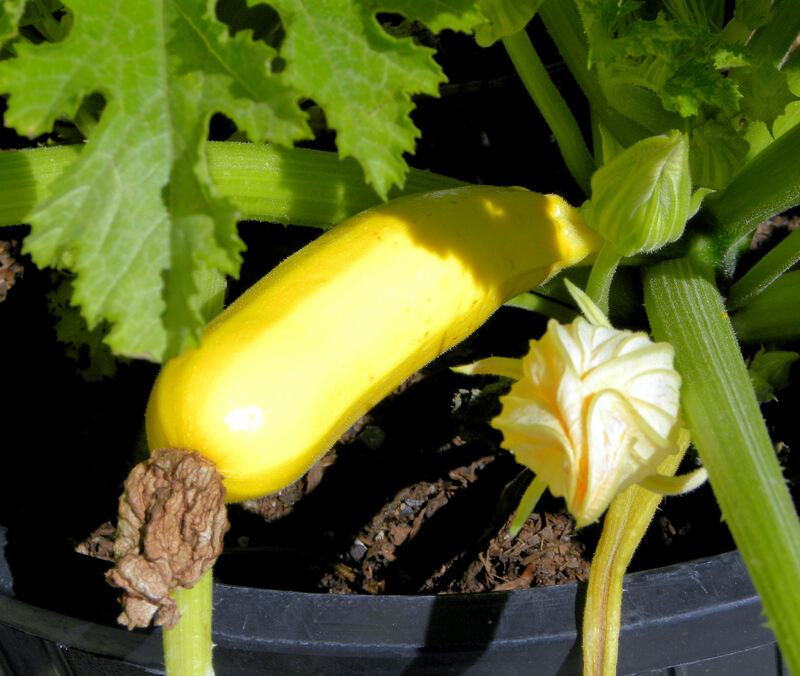 The first Gold Rush zucchini has set fruit and is only a couple of days away from harvest. Finally, a summer squash! I'll close with this shot of my "Driveway Garden" where I'm growing German Butterball potatoes, sweet potatoes, sunchokes, pumpkins and squash. This entry was posted in Uncategorized and tagged bay laurel, butterfly garden, Fruit, Fuyu Persimmon, lemon, orange, photos, vegetable garden. Bookmark the permalink. Good advice, Clare at Curbstone.